Are you looking for an easy way to clean your windows? Many window cleaners on the market today don’t clean windows as well as they should. It can sometimes be difficult for them to clean certain areas on them. For this reason, you should consider using a magnetic window cleaner. What is a Magnetic Window Cleaner? Are These Window Cleaners Safe to Use? 6. The Glider D-3, Magnetic Window Cleaner for Double Glazed Windows, up to 1-1/8 inch/28mm thickness. This type of window cleaner works to help you better clean your windows. 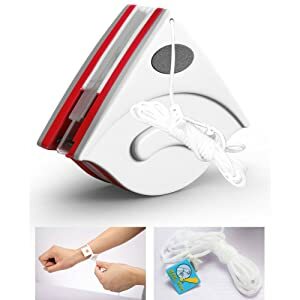 This type of window cleaner is filled with strong magnets which help to keep the window cleaner from falling or breaking while you’re cleaning with it. It will use the magnets built into it to lock itself through the glass on the window. Because it attaches both of its sides on the separate window panes, both will work to clean the different window sides as you move it. This means that as you clean the inside part of your window, the outside part will start to clean as well. This will help to ensure that you can clean windows safely and easily. As you can see from the section above, it is very simple to use. You just need to take the two sides of the product and attach one to the outside of the window and one on the inside. The two magnets will then attract each other and will allow you to start cleaning your window. As you work to clean the inside of the window, the outside magnet will follow the same path and clean the outer window pane. Depending on the type of window cleaner you buy, the cleaning paths will work differently. If you decide to buy a robotic one, these usually come with preset routes which often move in zigzags. Other window cleaner models might need you to move them horizontally or in other directions so they can properly clean your windows. 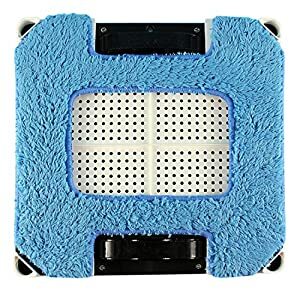 However, be sure before attaching the magnets together that you put some cleaning solution on both of the cleaners’ sponges so it will work to wash the window. There are a few features you should look for in one of these window cleaner types. One feature to look for is the size of the model. You don’t want to invest in a window cleaner that might be too big (or even too small) for your windows. This could lead to them not being able to fully clean your windows properly. Another feature to look for is the magnet strength. As these window cleaners rely on magnets to work, you want to make sure they are strong. A weak magnet could end up making it difficult for you to clean and could even cause the window cleaner to fall off the window. You also want to look at the window cleaner’s absorption ability. As you apply cleaning solution to the window cleaner, you want to make sure it will absorb that solution off of the windows. If not, it could end up leaving a residue on them. Another feature to look at is how versatile it is. While this isn’t crucial, it’s still a nice feature to have. If one of these window cleaners is versatile it will not only work to clean windows, but also other surfaces like floors. The other feature to look especially for in one of these window cleaner models is a safety rope. A safety rope will help to ensure that if for some reason the magnets don’t hold together, the rope will keep the window cleaner from falling. This is a good safety feature to have in one of these products. There are many benefits that these models have. One is that they make cleaning easier. You don’t have to worry about having to clean one side of the window and then going outside to clean the other. With one of these window cleaners, you can do it all at once. Also, because it uses a magnetic system, you can use it with windows that are located on upper floors safely. Many times cleaning windows that are on a higher floor level can be a difficult task. However, this window cleaner will let you easily and safely clean them without you having to worry about injuries occurring. These are great to use in situations like this as they can clean windows that are often in hard to reach areas. These also work with many different window types, like single and double pane windows. For instance, if you have many double pane windows you need to clean, you should look for a magnetic window cleaner for double panes. Overall, these window cleaners have the great benefit of being able to be used with almost any type of window. While these window cleaners are easy to use, you do have to be careful with them. You want to make sure to not lean too far out the window to attach them. This can end up causing major safety issues if the window is located on a high floor level. You want to put your hand out the window just enough to attach the outside window cleaning piece. After you do that, you should move your hand and arm back inside. So while these aren’t dangerous to use, you do need to be careful when applying them to the outside window and taking them off. These magnetic window cleaner products by Baffect are some of the top on the market today thanks to their extreme durability and remarkable cleaning functions. Made out of a tough plastic material, the magnetic window cleaners work to quickly clean dirty windows with their different measuring functions. They come in 4 different colors, all of which are a certain size to help the product better clean the windows. The blue color works to clean one layer glass on windows and measures 3-8 mm. The green cleaner measures 8-15 mm and works to clean a thick single window. The lighter green item is designed to clean hollow double layer windows and measures 15-26 mm. The purple cleaner measures 18-30 mm and cleans thick hollow double layers of glass. 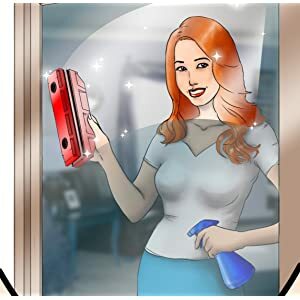 This product is made with a unique triangular design which works to help clean window edges easier, a spot that is often difficult to reach when cleaning these items.These affordable cleaners feature a soft cotton padding to help clean areas and a water storage container so the cleaning solution doesn’t run everywhere. They also feature a sturdy handle you can hold on to when cleaning so your grip doesn’t slip when cleaning with it. There’s also a special wiper on the end of them which helps to clear away any cleaning solution on the window when you move the cleaner against it. This product also features a few strong magnets inside to help keep it secure on your window so it doesn’t fall off when in use. If the cleaner does happen to accidentally fall, there’s no need to worry about it breaking thanks to its strong plastic shell. This helpful product comes with 4 fixed buckles, a sponge cleaning sheet, and scraping tape you can use to help make cleaning your windows easier. This robotic window cleaner comes with a white and black design. Because it is a robotic cleaner, it comes with 3 preset routes that move in a specific pattern. You can choose which pattern you’d like to use with your window. This model is ideal to use with framed glass. However, be sure that the glass is thicker than 6 mm. To start this window cleaner you can press the start button on the front of it or power it on with its remote control. It takes this model 4 minutes per square meter to fully clean your windows. The remote control will not only start the device, but pause it as well. This is a great feature if you need to suddenly stop it from working. It can reach many areas on the window. This model is very versatile. You can clean not only windows with it, but floors as well. You just need to make sure the floors are wet before using this model on them. It comes with a back-up power system. This will help the window cleaner stay on the window for 30 minutes without falling if it suddenly runs out of power. This window cleaner comes with a safety rope and extension cord. It is a little more expensive compared to other window cleaner models. While it can reach many areas on the window, it doesn’t do as well with cleaning corners. This might mean you need to clean the corners yourself for a full clean. The remote can sometimes be a little difficult to use. It can be a little hard for it to send information to the window cleaner through the glass. This window cleaner model is ideal to use with single-glazed windows that are 0.2-0.5 inches thick. It is made with a stylish green design. On the top of this model you’ll find a Spongia feature which will work to store water in this model to help it better clean your windows. This model is made with NdFeb magnets. Besides green, this window cleaner also comes in a red color. This red color will work for windows that have a thickness of 15-24 mm. It has a strong absorption. This will help to prevent residue and water from being left on your windows after it cleans them. It clean windows well. You won’t have to worry about soap or dirt being left behind. It will even clean the hardest to reach areas so they are spotless. This window cleaner model can be a little heavy. You’ll have to watch it closely to make sure its weight doesn’t have a negative impact on your windows. The magnets aren’t as strong as they probably should be. Because of this, you’ll want to check the window cleaner constantly to make sure it’s still attached to the window. No instructions come with this window cleaner. This might make using it a little difficult. 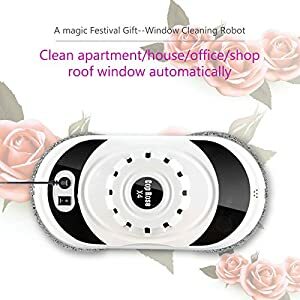 This robotic window cleaner features a white and black design. You can easily start it with the power button located on the front of it. There is a special Smart Move Navigation feature built into this window cleaner to help it better clean your windows. This feature will spray, then power itself on, and then start to clean. It takes 3 minutes for this window cleaner to clean 1 square meter. This window cleaner will automatically stop itself after cleaning your windows. This helps to prevent it from continuously working. It comes with 12 fiber cleaning cloths. These cloths are washable so you are able to reuse them. It is able to work with many different window types, like framed and frameless ones. This model comes with a safety rope, extension cord, remote control, battery, and manual. The safety rope included will help to prevent it from falling off the window, which could possibly end up causing injuries and damages if it does. This product is very versatile. It will not only work to clean windows but floors as well. Sometimes the magnetic grip might not work too well with this cleaner. It might occasionally slip sometimes from where it is working. While it does work with almost every window size this can be a little bit of a drawback. It might not be able to correctly guess what size window it is working with. This robotic window cleaner is ideal to use with tall and frameless windows. It is created with a white and black design and is made with a square shape. The power button is located conveniently on the front of it. Also on the front you’ll find Ready and Battery light indicators to help you know the current status of the window cleaner. This model will work to clean in a linear pattern and takes about 2.4 minutes to clean 1 square meter. This model is very versatile as it will work to not only clean windows but floors and tiles as well. It comes with a safety rope to help prevent it from falling off of the window it is cleaning. This can prevent it from falling on someone below or causing damages to your window. This model comes with a remote control, 4 cleaning cloths, and long and short hair mop cloths. It also comes with a manual to help you better understand how to use this window cleaner. 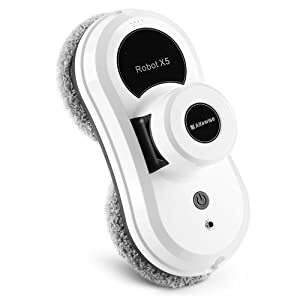 To help it better clean an area it has a laser sensor built into it. This will help it to map out the area it needs to clean. While it might clean well, it doesn’t always leave behind a professional clean. It’s a good product for just basic window cleaning. If you want a more in-depth one, this might not be the ideal product for you. This model does tend to be a little expensive. This Glider magnetic window cleaner is good to use with double glazed windows that are 1 1/8 inch thick. It is designed with a red and green coloring. This model comes with 2 pieces: outdoor and indoor. These 2 pieces will either attach to the outer window area or inner window area. As you attach it the pieces will connect together due to the magnets in them. To clean the space with this cleaner, you can start to move these two pieces (after they have been attached) horizontally. The 2 squeegees on each piece will work to help wash away dirt on your windows. This product also comes in a blue design. A safety rope is included with this model. This will help to prevent the cleaner from possibly falling while it’s cleaning. This model comes with a microfiber cloth which will work to wipe away dirt and absorb the cleaning solution you use on the windows. It is a very durable model. It can withstand heavy duty use. So, if you need to use a window cleaner often, you should consider this model. The magnets built into this product are very strong. In fact, this model has 4 magnets altogether (2 on each piece). This helps to prevent the cleaner from falling off from the surface it is cleaning. Sometimes it can be a little difficult to set up. This might make using it a little confusing. The clean is good, but sometimes it’s not that great. If you want a deep clean, this probably isn’t the right product to use. This article highlighted 5 of the best magnetic window cleaners on the market. They will all work to clean your windows, but one works especially well. The Cop Rose X4 model is one of the best on the market because it works well to give windows a deep clean. It can even reach some of the hardest areas on windows, like the edges, which many windows cleaners sometimes miss. It is also safe to use thanks to the safety rope that comes with it. Besides these features, it’s also versatile. It can be used to clean surfaces other than windows. If you plan to shop for one of these products, you should definitely consider the Cop Rose X4. Thank for your list. I never heard about this tool before. It’s amazing. I like the idea that we can clean the outside window more safely. This might work with single glass windows. How about double glass insulation elements? Hi, I really need some advice. We’ve recently had sliding doors fitted into our new loft conversion and on one side of the doors the space between the outer side and the glass balustrade is only 1.8cm. Is there a magnetic window cleaner on the market thin enough to use in this space?